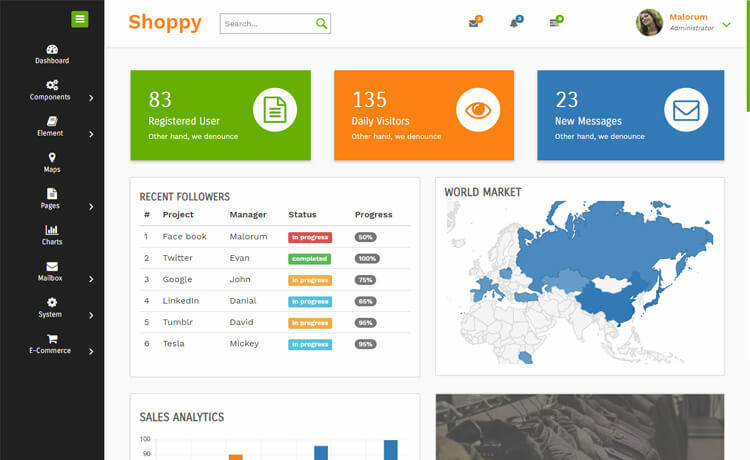 Shoppy is a free HTML5 admin panel template. There are dashboard overview page, maps, charts, pre-built pages are included with it. Shoppy comes with Doughnut, Line chart, Polar chart, and Pie chart. Besides, a product page with a modal image viewer and pricing table are also inside the box. Shoppy is a free admin panel template for e-commerce. It is a free HTML5 template built based on Bootstrap framework. Intuitive code and alterable characteristics make it a highly adaptable theme. Shoppy has a flat, clean and minimal design with a responsive layout. Moreover, it has a sticky header with notification buttons. There are dashboard overview page, maps, charts, pre-built pages are included with it. Shoppy comes with Doughnut, Line chart, Polar chart, and Pie chart. Besides, a product page with a modal image viewer and pricing table are also inside the box. Thank you for downloading Shoppy.